Join the first Oasis Digital Hackathon. Create a game using the Oasis Gaming SDK, submit it and win! What is the Oasis Gaming SDK? 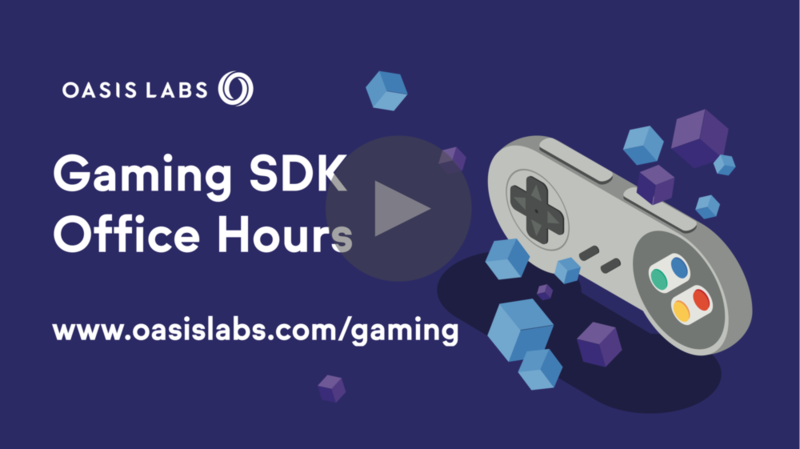 The Oasis Gaming SDK is an all-new developer toolkit that makes building and deploying games on Oasis faster and easier to do. Utilizing confidential smart contracts, the SDK lets you create multiplayer games with confidentiality built-in. Confidentiality can prevent your users from cheating –– peeking at others’ cards, predicting a card before it’s dealt, or seeing others’ moves before they’re ready. Want to play before your build? Check out the Oasis Arcade to play pre-made versions of classic turn-by-turn games. Watch our last office hours and see first-hand demos from Raymond Cheng (CTO) and Noah Johnson (CPO). They’ll walk through how to get started on the Gaming SDK, share some of our favorite demo games, and answer questions from developers like you. Submit your best game and win! When do I need to submit my game to be eligible to win? All eligible games must be submitted by 11:59pm PT on April 15. We will announce winners soon after. What qualifies as an eligible game? We will give prizes for the best turn-by-turn game and the best collectibles game. To qualify, your game must take advantage of the Oasis Gaming SDK and deploy at least one confidential smart contract on the Oasis Devnet as a part of the game. You can utilize sample code from the Oasis tutorials, use a game you’ve already created and port it over to the Oasis Devnet, or build a game from scratch. All games will be reviewed and judged internally by CTO Raymond Cheng and CPO Noah Johnson. I'm interested but need more detail about the framework. How do I find it? To start, take a look at our documentation at docs.oasiscloud.io. We’ll also be hosting an Office Hours to answer any questions in real-time on March 26. And if all else fails, please email us at info@oasislabs.com and we’ll get back to you ASAP.